This past Sunday NFL players went down in droves suffering an alarming number of injuries. The serious nature of each of these injuries is a hot topic on sports radio and television programs. What is not being discussed is the psychological toll serious sports related injuries might have on these athletes. Quarterbacks were hit particularly hard. Rams Sam Bradford suffered a torn ACL, the Bears Jake Cutler a torn groin, and Eagles QB Nick Foles a concussion. A torn LCL and broken leg took down Texans linebacker Brian Cushing. This after suffering a season ending ACL injury on the same knee last season. Colts receiver Reggie Wayne suffered a torn ACL. Tampa Bay receiver Doug Martin suffered a torn labrum. The Packers Jermichael Finley is out with a serious head and neck injury. And the Bears Lance Briggs suffered a shoulder injury. All of these injuries are serious in nature. Some might be career threatening or career ending. 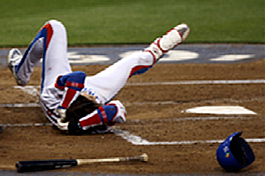 It is well documented that athletes suffer intense physical pain when injured. There is nothing pleasant about breaking bones and tearing ligaments and tendons. What is not well documented or being discussed is the psychological pain and suffering athlete’s experience at the time of the injury and throughout the entire diagnostic, surgical, and recovery process. There is a spectrum of severity with sports related injuries. Mild injuries might require time off and therapy. More serious injuries require surgery and rehab. The most intense can be career threatening or career ending and can place the athlete’s future participation in sports in question. Athletes on the more severe end of the spectrum have talked with me about how bad the injury was when it occured. But in most cases the most painful experiences while injured are the key impact moments that occur after the injury. These after injury memories are filled with intense mental imagery and powerful emotion. The memory and image of being carried off the field strapped to a stretcher, the Doctors diagnosis in the locker room at halftime, a phone call getting the MRI results from the team Doctor, and receiving word that the injury will require surgery are mentally and emotionally overwhelming for some athletes. When an athlete receives word that their career might be in jeopardy the impact of the injury and the shock wave of emotion can be traumatic. Sports injury trauma is taking a toll on athletes. There is a lot on the line for an athlete who suffers a serious injury. These injuries have severe impacts on Jr. High, high school and college athletes. The impact is especially impactful to professional athletes. Professional teams have a major goal. To win. Like it or not an injured athlete is not part of the winning strategy when on the sidelines. Another player steps in and the game goes on. This puts an athlete’s identity into question. Who am I if I am not playing the game I love? If I am not playing the sport that has defined me in so many ways then what do I do? A lack of connection to a team or organization leaves many athletes feeing anxious and depressed. I have heard many athletes say that the loneliest place in the world is on the sidelines watching the game after being injured. There can also be financial or contractual issue to face when injured. I have worked with professional athletes on a one year contract or in the last year of their contract when they suffer a devastating injury. The fear, anxiety, and uncertainty these athletes experience can be overwhelming for some. Many athletes are waived and are left to try and get on with another team. Many never make it back to playing at the level they played before being injured even though they have been cleared to play physically. Many athletes have to deal with the fear and anxiety that comes with returning to play after being injured. Advances in surgical procedures, improved skills of physicians, advances in treatment and physical therapy all help athletes return to play faster than ever before. Coming back faster comes with the expectation that an athlete will be ready to play at a high level once released. These athletes have been cleared as physically “100%” ready to play. This definition does not take into account the mental and emotional readiness of the athlete upon return to play. An obvious key to a successful comeback for an athlete is to address the physical stress and trauma associated with the injury itself. It is time to take this process further. Addressing the mental and emotional stress and trauma the athlete suffers and endures from the time of the injury, throughout the pre-surgery, post-surgery, and recovery process, and as they prepare to return to play is a new paradigm to consider. Expanding the “100%” definition of readiness will insure that an athlete is truly ready to play again. Athletes return to play with more confidence, less fear and anxiety, and experience more trust in their injured or affected area of the body. The fear of re-injury is diminished. In most instances entirely. The methodologies, treatment protocols, and technologies to treat this aspect of injuries are in place now. With the increase in serious injuries in the NFL and all sports in general it is time to integrate this new paradigm in the treatment of athletic injuries. Athletes return to play physically, mentally, and emotionally ready to go. They are truly “100%” ready to play. For many athletes coming back from a serious sports related injury is a terrifying ordeal. They have been cleared to play physically, but their fear of suffering another injury can be debilitating. These fears can cause complications with their return to play. Many suffer from confusion, anxiety, anger, shame and guilt. If they have been cleared to play then whey do they feel so bad? Many feel that something is wrong with them if they can’t come back confident and in a good frame of mind. I was talking with a soccer player and one of their parents about a teammate who suffered a strained ACL. The injured athlete took time off for the injury to heal. When they returned to play they were terrified. They were afraid of injuring their knee again and played with anxiety, fear, and apprehension. They did not play all out and their hesitancy was apparent. It grew worse with each game. As their anxiety and fear grew they became more emotional during the games. It was apparent to everyone watching that something was wrong. I began to get excited at the thought of helping this athlete overcome their sports injury trauma. As I reached for a business card for the parent of the struggling athlete I was told that during their last game the athlete had torn their ACL completely. The field was in really bad condition and their fear of re-injury was amplified. They were crying while trying to play soccer. They ended up in a fight for the ball and injured their knee. I felt my heart sink when they told me this part of the story. I was on the sidelines of a football game watching a running back who had torn his ACL the year before. He was hesitating as he ran and favoring the injured knee. After the game I told his coach that he was going to suffer an ACL injury to the other knee if he didn’t get some help with the trauma from the first injury. The next week he tore his other ACL. I was watching a game on television and I observed hesitation and apprehension in an offensive lineman who had injured his left knee the year before. I turned the game off at half time. A few days later I called his athletic trainer and mentioned to him that I believed that this lineman was heading towards an injury on his other knee. He asked me why I felt this way. I told him what I observed watching the game. He said that was interesting and that the lineman had torn his other ACL in the fourth quarter of that game. Is the Wrong Message Being Sent? An athlete I helped overcome a horrific injury was interviewed about his “miracle comeback”. When they asked this athlete what they did to make such a profound come back they said they just had a “really strong attitude and mind set”. They didn’t mention all the hard work they did mentally and emotionally to overcome the trauma they suffered while injured and unable to compete. I believe this athlete did a disservice to other athletes who are trying to overcome the trauma and the mental and emotional blocks that stand in the way of a full “100%” recovery. They sent a message to other injured athletes that all you have to do is have a strong mindset and everything will be o.k. This message can have a profoundly negative impact on the athlete who is struggling to get back mentally and emotionally. It can create doubt and confusion, and erode self confidence. Many athletes never find their way back from injury because they can’t overcome this cauldron of powerful emotions. I was watching a game on TV recently. An athlete I helped overcome a serious injury was having a great game. It was apparent that they were confident, in command, and had no fear of re-injury. 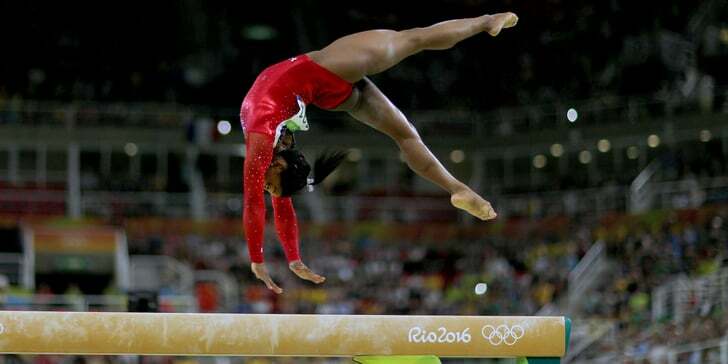 The commentator said it was apparent that this athlete was back physically, but that they were back mentally too. My wife asked me to replay his comment. We listened to it again and she said “someone gets it”. This commentator could see from the way this athlete was playing that they have experienced a complete psychological recovery from their injury too. It is not uncommon for an athlete to experience hesitation and a diminished competitive spirit after knee surgery. It is also common for athletic trainers to want to find the best way to help an injured athlete through this phase of recovery. The AT remembers how the athlete performed before the injury and wants to help him/her return to that same level of performance quickly. But athletic injuries change a person. Something is taken from the athlete who suffers an injury. Because of an injury, athletes might miss a game, a season or an entire career. They might lose mental and emotional spontaneity and freedom when they compete. And they might miss out on the thrill of a long playoff run, the excitement of being a part of something bigger than themselves. Physical injury can easily cause mental pain and feelings of loss. Each loss is specific to the athlete, and no one knows how deeply affected an athlete is  unless we ask. Athletic trainers are wise to take into account the mental and emotional injury the athlete has suffered, as well as the physical injury. The athlete can recover from the injury in a profound way. S/he can reclaim much of what has been lost if given the opportunity to work through the injury physically, mentally, emotionally and spiritually. As athletic trainers can attest, it takes a team to treat a team. Athletes rely on ATs, personal coaches, nutritionists, sports counselors and many other types of providers to gain a competitive edge. Use this collaborative approach! Find a mental health professional you trust, and build a working relationship with that person so you know where to send an athlete who needs specialized support on the road to recovery. Once the athlete begins to move the leg, which nowadays is immediately after surgery, s/he faces more intense agony. Back in the days when they put ACL injuries into a hard cast I actually witnessed athletes faint when they viewed their leg once the cast was removed; the leve; of atrophy was so alarming they could not cope. Physical pain and mental frustration during rehabilitation. The collective emotional and mental suffering the athlete experiences  from the point of injury to the end of physical rehabilitation  represents a significant obstacle to complete recovery. The athlete might look like s/he is completely recovered physically, but the inner world of the injured athlete requires its own process of recovery. I was talking with a high school coach about an athlete who had suffered a torn ACL. We talked about the order of care this athlete received: the athletic trainer, team physician, orthopedic surgeon and so on. I asked him if the athlete should be ready to go once released and declared fit to play. He answered yes; they are considered 100 percent after all the health care professionals sign off. We then went over the timeline from injury to full physical recovery, and I asked him if he thought the athlete experienced any intense emotions or mental stress during any of the steps in the healing process. There was a long pause, and he said, Absolutely! So I asked him who helps the athlete cope with this cauldron of emotions, and after another long pause he said no one does. I talked with an athletic trainer about another ACL related injury. This AT told me they have the athlete go out and purposely suffer a fall to get him/her past the fear of re-injury. The theory is that after a first fall, the returning athlete is fine. Athletic trainers can enhance the athletes recovery by working with him/her on the physical component to the ACL injury  AND (equally important) by keeping in mind the athlete has been through a tremendous emotional and mental crisis as well. Talk with the athlete about what is going on in that moment. You might also talk about to her about different aspects of the recovery process. But lets be clear: I am not encouraging you to become the athletes therapist or sports psychologist, but rather an ally who gathers information relating to the athletes emotional and mental state. As a way of gathering this important information you might ask them what it was like to go through surgery? What did they miss about not being able to compete? What was it like when they started walking again? How painful has the rehabilitation been? As you listen to the athlete be aware of areas where there might be unfinished business around the injury. Places where the athlete is hesitant to go, mentally and emotionally. These are warning signs that more attention and care is required to help the athlete through the complicated emotional and mental anatomy of the sports injury. This is where the collaborative approach to healing and rehabilitation can be utilized to get the athlete to the right person. 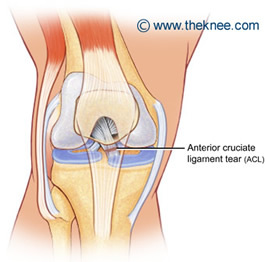 I have worked with many athletes who have suffered ACL injuries. Their parents, athletic trainers and coaches all tell me they seem terrified, afraid of doing anything for fear theyll be able to do nothing. The physical aspect of the recovery process is obviously critical. The mental, emotional and spiritual component must be addressed as well. Athletes have recovered from ACL injuries for decades, yet most of them have not been directed to do the inner work necessary to complete the recovery process. Some might argue they have done fine, and made their way back by focusing only on physical recovery from the injury. How much more profound would the recovery process be if we, as caregivers, embraced a model that heals not only the physical injury of the athlete, but the heart, mind and spirit as well? As an athletic trainer, do everything you can do to help them work through the injury physically. Progressively move them along and let them do more and more demanding and complex movements and exercises, and provide them a place to talk about what they have been through. If the athlete does not seem to be regaining confidence, intensity and focus in his/her sport, suggest visiting with a therapist or sports counselor who understands the traumatic nature of sports injuries. Utilize the resources available to help the athlete work through the injury on the physical, mental, emotional and spiritual fronts.